where a is the equatorial radius of the Earth (6371.2 km adopted for the International Geomagnetic Reference Field, IGRF); g? 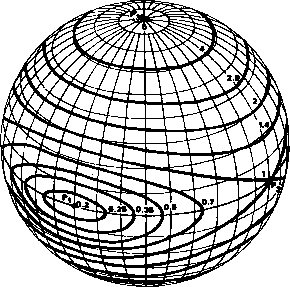 and A™ are Gaussian coefficients (named in honor of Karl Gauss); and r, 0, and 4> are the geocentric distance, coelevation, and East longitude from Greenwich which define any point in space. Table H-l. IGRF Coefficients for Epoch 1975. Terms indicated by a dash (-) are undefined.